TE Connectivity (TE) introduced its high-power AMP MCP 9.5 two position connectors designed for harsh environment wire-to-wire and wire-to-circuit board connections. 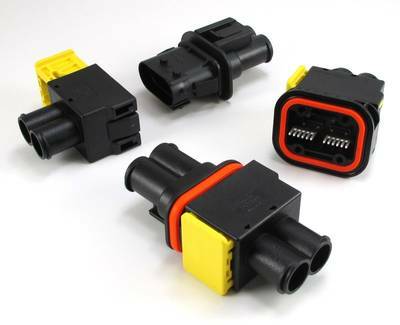 AMP MCP 9.5 two position connectors are designed to withstand the extreme conditions of the trucking, agricultural, mining, construction and marine industries. The connectors utilize TE’s field-proven AMP MCP 9.5 contacts and have a current rating of 78 amps for 10 millimeter² wire. The AMP MCP 9.5 two position connectors are constructed of heavy-duty thermoplastic and withstand severe vibration and mechanical shock. They are IP 67 & IP 69K rated (with backshell) and protect connections from dust, dirt and moisture. AMP MCP 9.5 two position connectors have a minus 30 degrees Celsius to + 100 degrees Celsius long term operating temperature. Several mounting options for the connectors are available, including inline, flange, sealed flange and PCB mount, making them suitable for numerous application types. No tools are required for mounting, as the connectors feature a clip-in mounting feature. A slide lock is used for easy connector mating. For harsh environment applications that require a high-power, environmentally sealed two position electrical connector, the AMP MCP 9.5 two position connectors are a reliable solution. AMP MCP 9.5 two position connectors and the entire TE Industrial & Commercial Transportation product portfolio deliver reliable connectivity solutions for applications where failure is not an option.